The name of Johannes Gutenberg will forever be associated with arguably one of the most important events of the modern age, that is the “Print Revolution” brought about in the mid fifteenth century. Gutenberg was born in a city called Mainz in Germany towards the end of the fourteenth century. He was a goldsmith by profession, and his father belonged to upper class German society. Books in those days were written by hand and copied slowly and painstakingly from one manuscript to the other, which is why only the rich could afford them. It also led to transcription errors from one copy to the other. Gutenberg’s father was wealthy so he could afford to own books, which is how Gutenberg learned to read and write. Before Gutenberg invented the printing press, another way of printing was already in existence. This was known as block printing and it involved carving letters into blocks of wood which would then be dipped in ink and pressed onto paper. Each page would be printed by carving the letters onto a block of wood the same size as the page of a book. Once the letters had been carved, the remaining wood would be shaved away. This made the letters raised, and they would then be imprinted on to the page. Although this was a better way of producing books than copying each version by hand, it was still a very slow process and the carved blocks could only be used for one book. Gutenberg revolutionized this process by inventing movable type printing. So the letters could be rearranged to form new words without having to carve them into wooden blocks each time. This invention enabled mass production of books and led to widespread dissemination of knowledge, accessible to the masses and the common man. Johannes Gutenberg rented out a ruined building in Strasburg where he conducted experiments on building and perfecting an improved method of printing. He kept at it but did not succeed initially. Eventually, he ran out of money and was at a dead end in his career. At this point he met Jonathan Faust who was a wealthy lawyer and goldsmith. 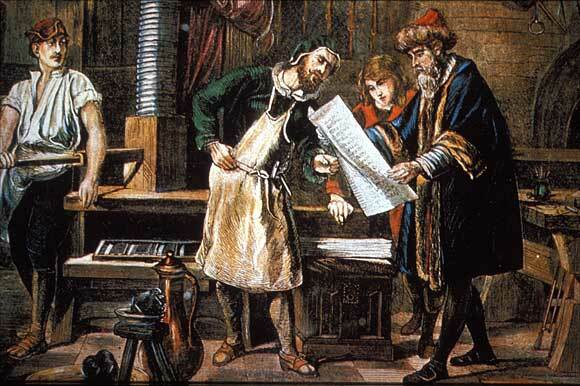 Gutenberg explained his situation to Faust, who was interested in the venture and he agreed to finance his work. Gutenberg used the new infusion of capital to experiment with different types of wooden blocks to see which one provided the sharpest results. He also invented movable type letters which could be rearranged to form new words, letters and pages. This way he would not need to carve out entire pages every time he needed to print something new. However, he was not satisfied with the results of wooden letters so he moved on to metal. This provided much better results and he went on to start printing the first book ever printed by movable type letters, that is, the Bible in Latin. It was printed in two volumes with 300 pages each. During this time, however, Faust had a quarrel with Gutenberg regarding the return on his investment. He believed that Gutenberg was wasting his time and not providing good results. Faust eventually took Gutenberg to court and sued him for all his property. Faust won the case and all of Gutenberg’s possessions, including his tools and half finished book, were confiscated by the court and handed over to Faust. Gutenberg was now broke and Faust hired others to finish printing the Bible, now popularly known as the Gutenberg Bible. It is now worth thousands of dollars in the market. In fact each page of the Gutenberg Bible is worth at least $100,000 according to some sources. Johannes Gutenberg died in 1468, a broke and abject man, dying without being credited for one of the greatest and most useful inventions known to mankind.